I can't thank you enough for checking out my project. I hope that fall has been good to you not like here we had 3 inch hail. Today's post is Just-a-Scrapin' challenge Oct. 9, 2015 Celebrating Fall. With water damage inside and hail damage outside I had to do something out of the box to lighten up. All embellishments, paper and card stock is from my stash so I do not have all the names of the companies. 1. I started with Hallmark classic greeting card paper card base from Hobby Lobby. 2. From my paper stash used PP with a child and red flowers cut to fit the card base. 3. With blue chalk I did the edges, the die cuts for Happy Birthday and Way To Go! 4. Cut the vase from blue felt. 5. In my stash I found the wonderful flowers, paper and silk, added centers with Glue Dots. 6. Took the flowers and leaves glued together, layered everything onto the card base. Inside glued the saying. 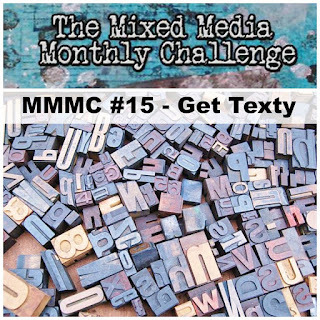 Today I'm doing Mixed Media Monthly Challenge #15 - "Get Texty"
All embellishments, canvas, paper and card stock is from my stash so I do not have all the names of the companies. 1. I started with Faber-Craft Gesso over the canvas. 2. With Paletti ink colored in the purple top. 3. I took Darice Dye Based Purple and filled in background. 4. Using The Girls Scrapbook Stickers by Creative Imaginations I colored in the pants and top with Bic Markers and applied. 5. For the bottom I used Ranger Texture Paste and inked with Darice Dye Based black. 6. Last computer printed on clear lables "Focus...", applied to canvas and using a chock covered to blend into the background. Thanks so much for stopping by for Just-a-Scrappin' Challenge 7-23-15 Create a card with Lace. This is also the May Art flower challenge. I was a Ribbon Flower Challenge Participant and May Art Ribbon sent this ribbon 2.5 Inch Elastic Lace Ribbon 490-25-05 Lavender, 490-25-34 Light Blue, 10 yards each. Wonderful! All other embellishments, paper and card stock is from my stash so I do not have all the names of the companies. I have a card with a lace hair band and ribbon flower this time. Also a top with the same ribbon as trim. I'll send this to my great grand daughter, she loves mail and this time be able to wear the stuff! 1. I started with one cut of Lavender May Art Ribbon 8" and one 12". 2. Sewed a long stitch down the center of each then gathered the ribbon to form the flower. 3. Cut and length of ribbon for head band and sewed ends together then sewed the 8" flower to the head band. 4. I slipped the headband onto the card then added computer printed sentiment. On the top I added two rows of the lavender May Art Ribbon and the 12" lace flower . Thanks for visiting! Wishing you a happy and productive day. I'm doing Just-a-scrapin' DT 7/16/15 All embellishments, paper and card stock is from my stash so I do not have all the names of the companies. 1. I started with A2 card base from Hobby Lobby. 2. I printed out the Harvest quilt pattern onto photo paper and trimmed to A2 size. 3. Then adhered the paper to the card base with ATG tape runner. 4. The sentiment is computer printed onto a clear address and adhered to card base. Hello! Thanks for visiting today. Welcome to Just-a-Scrapin' July 2, 2015 challenge Celebrate Independence Day. All embellishments, paper and card stock is from my stash so I do not have all the names of the companies. 1. I'm using a white card base A2 from Hobby Lobby. 2.. I fussy cut the fireworks, adhered the circles to the top of card base. 3. Added the self adhered word stickers. the hop linky closes Friday, June 12th @ 11:59 pm PST. Remember, the theme is summer! Your projects must be newly created and PLEASE, no back linking. join our Facebook group. PLEASE turn off your word verification. All embellishments, paper and card stock is from my stash so I do not have all the names of the companies. 1. I used a Ice Coffee Cup with 2 packs of ground coffee inside. 3. Using Owl for Pooh adhered all to the cup using Scrapbook Adhesives Dodz small. Thanks for visiting today for Just-A-Scrappin' 6-11-15 Challenge Happy Graduation. All embellishments, paper and card stock is from my stash so I do not have all the names of the companies. 1. I used Hobby Lobby's kraft card base and patterned card stock for the background. 2. Using my new Cricut Explore I cut "way to go" out of heavy card stock and "Happy Graduation" out of black card stock. 3. On the front I added a tassel in sliver and the way to go with ATG tape runner. Then to the card base. 4. Inside I use small foam dots to add the "Happy Graduation".